As tensions mounted over a face-off with Damascus-ally Russia, opponents of unilateral US action called an emergency closed-door meeting of the UN Security Council for Thursday. Britain also scheduled an emergency cabinet meeting. 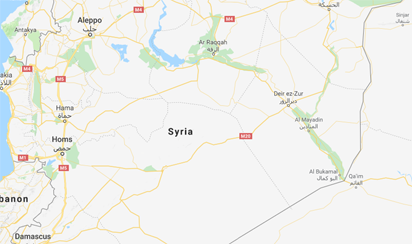 With punitive US military action seemingly imminent, Russia scrambled to deflect blame from Syria’s Bashar al-Assad and, according to a monitor group, regime forces evacuated key defense buildings in Damascus. Defense Secretary Jim Mattis as well as CIA director Mike Pompeo met at the White House on Wednesday to discuss options, White House spokeswoman Sarah Sanders said. “Today, I called the ambassadors of the five permanent members of the Security Council to reiterate my deep concern about the risks of the current impasse and stressed the need to avoid the situation spiraling out of control,” he said, referring to the United States, Russia, China, France and Britain. Moscow and Washington have so far vetoed each other’s motions to set up an international investigation into chemical weapons use. Meanwhile, the Russian defense ministry said the Syrian regime flag was flying in Douma — the target of Saturday’s attack — which it said indicated government forces have taken full control over the formerly rebel-held district of Eastern Ghouta. “The raising of a regime flag over a building in the town of Douma signified control over this town and consequently over Eastern Ghouta as a whole,” Major General Yury Yevtushenko was quoted as saying Thursday by the Interfax news agency. The Russian army has continued to deny their side’s latest victory came after Assad launched a chemical attack on the last rebel-held pocket of the enclave in the Damascus suburbs, instead accusing the White Helmets civil defense organization of staging the massacre. “The situation in the world is becoming more and more chaotic but all the same we hope that common sense will finally prevail and international relations will take a constructive path,” he said. Trump’s tweets were more belligerent — he told Russia “You shouldn’t be partners with a Gas Killing Animal who kills his people and enjoys it!” — and declared that US relations with Russia have plunged to a historic low. But he notably also said there was “no reason for this,” reiterated his hope for talks with Putin to halt a new arms race, and blamed his domestic political opponents for poisoning ties. Trump and other Western leaders have vowed a quick and forceful response to Saturday’s alleged gas attack, which rescue workers say killed more than 40 people. British Prime Minister Theresa May has called an emergency cabinet meeting for Thursday, while French President Emmanuel Macron is to decide on a response in the coming days, having insisted he does “not want an escalation” and that any response would focus on Syria’s chemical capabilities, not on allies of the regime. As it looked to head off the threat of Western strikes, Syria said it had invited the Organisation for the Prohibition of Chemical Weapons, which has blamed the regime for previous attacks, to visit the site. That incident, which killed hundreds, also took place in Eastern Ghouta. The post UN warns against letting Syria crisis ‘spiral’ out of control appeared first on Vanguard News.